Today, 25 years after his death, the reputation which Hoover helped build for the FBI-one of excellence, integrity and public service-remains unblemished. This May, thousands of former agents of the Federal Bureau of Investigation (FBI) and legions of Americans will commemorate the 25th anniversary of the death of its No. 1 crime fighter and one of Freemasonry’s most renowned Brothers, Illustrious John Edgar Hoover, 33, Grand Cross. During his 48 years as Director of the Bureau, Hoover transformed the FBI from a haven for political “hacks” into a state-of-the- art national center for law enforcement with extensive fingerprint files, nationwide crime statistics, a technologically advanced laboratory, and a top-notch training academy. 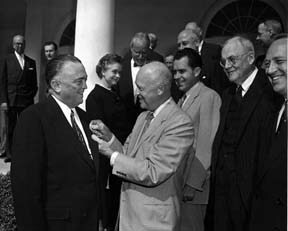 President Dwight D. Eisenhower honors Illustrious J. Edgar Hoover, 33, Grand Cross, at a special White House ceremony. His administrative genius, high personal standards, and die-hard patriotism helped make the Bureau one of the most powerful and influential law enforcement organizations in the world and a model of excellence and integrity. Ill. Hoover was just as devoted to his Masonic Brothers. He was raised a Master Mason on November 9, 1920, in Federal Lodge No. 1, Washington, DC, just two months before his 26th birthday. During his 52 years with the Craft, he received innumerable medals, awards and decorations. In 1955, for instance, he was coroneted a Thirty-third Degree Inspector General Honorary and awarded the Scottish Rite’s highest recognition, the Grand Cross of Honour in 1965. He elicited such loyalty among his friends and colleagues that 25 years after his death in 1972, Hoover’s supporters continue to work to preserve his legacy and the ideals and values by which he lived. To that end, the J. Edgar Hoover Foundation was established to carry on his tradition of service to the public good. The group’s selected avenue has been education. In the past three decades, the Foundation has offered hundreds of grants and scholarships to deserving young men and women across the nation. Several academic institutions and organizations, including Notre Dame, the National College of Criminal Defense Lawyers and Public Defenders, and the National College of District Attorneys, also have been awarded financial aid for specialized programs. Serious students of history cannot question J. Edgar Hoover’s patriotism and the contributions he made to the advancement of the nation’s law enforcement standards. This year, to commemorate the 25th anniversary of Ill. Hoover’s passing, the Foundation has begun a major fundraising campaign with a goal to raise $1 million to meet the growing needs for educational assistance. A strong believer in education, Hoover set out early in life to achieve far beyond his father, a low-paid federal bureaucrat. Born in Washington, D.C., Hoover earned a bachelor of law and a master of law from George Washington University. He landed his first job at the Library of Congress where he virtually memorized the library’s famous system of indexing. It was a modification of this system that he later implemented in the Bureau and which is still in use today. In 1917 he joined the staff of the U.S. Department of Justice, and two years later, at the age of 24, he was appointed a special assistant to the U.S. Attorney General. His early efforts attracted the attention of his superiors, and in 1924 the Honorable Harlan Fiske Stone appointed Hoover head of the Justice Department’s Bureau of Investigation. At the time, the ill-regarded Bureau was beset by scandal and run by hacks, ex-convicts and political appointees with little professional law enforcement experience. Hoover got rid of the flunkies, established professional qualifications, created a promotion system based on merit, and then set out on a recruiting program. In 1935, the Bureau of Investigation was renamed the Federal Bureau of Investigation, and with the change in name, came a change in philosophy. Hoover established the National Crime Laboratory, using the latest science and technology, and the National FBI and Police Academy in Quantico, Virginia, still considered the best post-graduate course for law enforcement in the world. The National Crime Information Center was also created to help federal, state, local and international law enforcement agencies, along with the FBI’s Identification Division, which uses an ingenious system of scientific fingerprint identification and exact indexing designed by Hoover. Today, the FBI has on file more than 173 million sets of fingerprints, the largest collection in the world. As the quality of Bureau employees improved, so did public confidence in the FBI. The importance of public relations was not lost on Hoover. He directed many of the Bureau’s activities toward areas of maximum public concern. In the 1930s, FBI agents pursued and apprehended many notorious criminals, including gangster Al Capone and bank robber John Dillinger. During World War II, the counterespionage and antisabotage operations conducted by the FBI were successful in preventing interference by German and Japanese agents with the United States war effort. Following the war, FBI agents infiltrated and exposed the Communist Party and the Ku Klux Klan, solved the Brink’s robbery of 1950, and took an active part in enforcing civil rights. Hoover fast became one of the most powerful figures in Washington and the confidant of the Presidents he served from Calvin Coolidge to Richard Nixon. 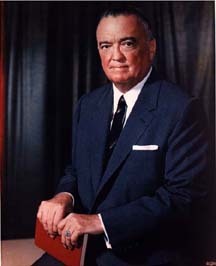 During the last decade of his life, Hoover was criticized for allegedly abusing his power and exceeding the jurisdiction of the FBI. But even revisionists of history cannot question his patriotism and the contributions he made to the advancement of the nation’s law enforcement standards. His many associates and supporters fully understand those false allegations were based upon sensationalized tactics developed by authors seeking ill-gotten funds. Today, 25 years after his death, the reputation which Hoover built for the FBI-one of excellence, integrity and public service-remains unparalleled. Those who believe in those ideals continue to promote them through the J. Edgar Hoover Foundation and the Society of Former Special Agents. Supporters of the Foundation help maintain the official collection of memorabilia from Hoover’s home and office, preserved in the J. Edgar Hoover Law Enforcement Museum in the House of the Temple in Washington, DC. The Foundation also awards hundreds of thousands of dollars in scholarships and grants to worthy students based on a combination of merit and need. It also supports various colleges and universities and youth organizations, such as the Explorer Scouts. As a private foundation, the organization relies on contributions from those who want to honor not only the man, but the love of country, fidelity to law, and dedication to the public interest which J. Edgar Hoover exemplified. Now in the midst of a major fundraising drive to meet a dramatically increased demand for scholarships and grants, donations payable to the J. Edgar Hoover Foundation can be sent to: The J. Edgar Hoover Foundation, c/o Richard S. Woods, General Counsel, Secretary & Treasurer, P.O. Box 5914, Hilton Head Island, SC, 29938.